The end goal for the typical online brand is to get some sort of a conversion. While there are exceptions, that goal is almost always a sale. One method that has been effective to accomplish this goal is the standard sales funnel, whereby registrants are put through a nurture sequence of email messages and landing pages. While effective, this method has a major weakness. 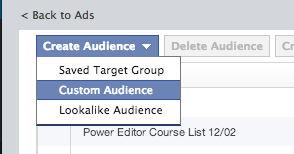 And that weakness can be solved through Facebook retargeting using Website Custom Audiences. If you haven’t created an online sales funnel before, you’ve likely been put into one. Users aren’t typically ready to buy immediately. The goal of a sales funnel using a nurture sequence is to attract users with something that is free and warm them up to the paid product through a series of messages. An example would include a lead magnet. This is a valuable (otherwise “premium”) piece of content that is offered for free in exchange for an email address. It could be an eBook or a video series on a very specific topic. Of course, this topic would be directly related to a premium product for sale as well. So it is assumed that anyone interested in the eBook or video series would also be interested in the paid product. Once opting in, the registrant is placed into a nurture sequence. They will receive a series of emails, likely directing them to various landing pages with more free “premium” content. The brand may choose to start mentioning their paid product (but not requiring a purchase) throughout that sequence. But when the final message is sent, a hard sales pitch is made. The hope is that the user not only now sees the value for the product, but trusts the brand’s expertise thanks to the content provided in the nurture sequence. 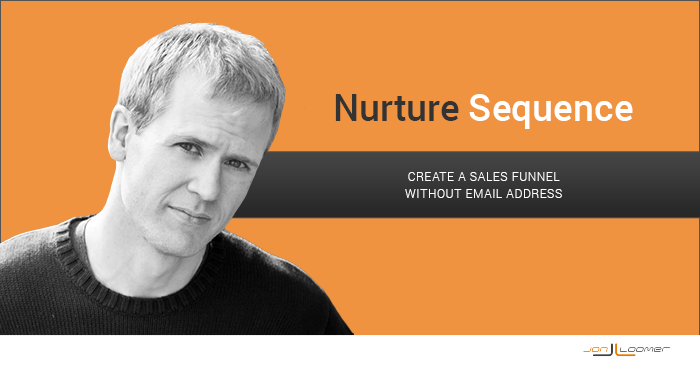 While effective, the typical sales funnel with a nurture sequence has one major weakness: It cannot work without first collecting a valid email address. Some users are more willing to provide an email address than others. And some users may provide an email address they rarely use, thereby limiting the effectiveness of a nurture sequence. When using this method, you may have a 30% conversion rate. Of the 1,000 people you send to your landing page, 300 will provide an email address and 700 will abandon. Those 700 people were good, strong leads. They showed interest. They simply didn’t provide an email address, for whatever reason. In the past, you lost those 700 people. Floated off into space. You may attract them later on, but you’ve lost them for the time being. 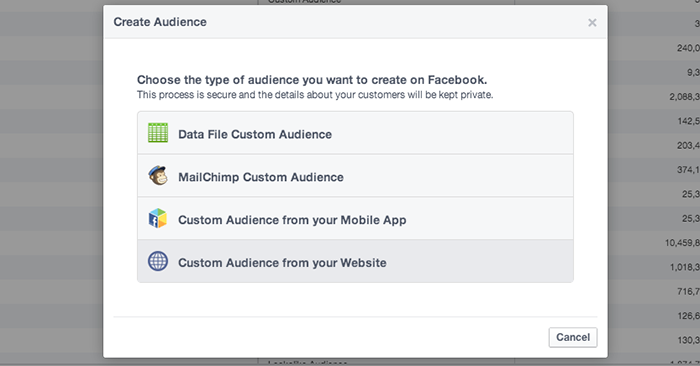 If you don’t know about Facebook Website Custom Audiences yet, you need to catch up! 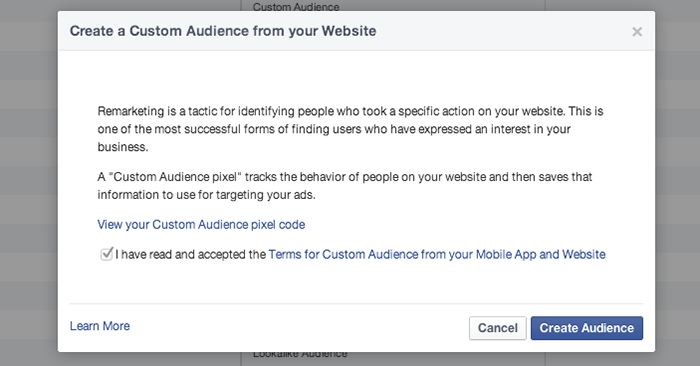 It’s a targeting feature that allows advertisers to create Facebook ads that reach website visitors — either visitors to any page or to a specific page. It’s possibly my favorite advertising feature ever created. Actually, there is no “possibly” about it. It is. There are limitless things you can do with this feature. One of them is creating a sales funnel without an email address. Don’t get me wrong, you should always have the collection of email addresses near the top of your list of goals. I’m not suggesting you should ignore list building. But you also shouldn’t ignore those who aren’t yet comfortable sharing this information. 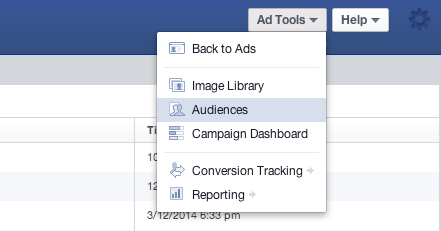 With Website Custom Audiences, you can target ads at people based on how far along they’ve moved along the funnel. How? Because they are getting cookied and Facebook is tracking it. Let’s go back to the video series example. In the past, someone would have needed to opt in to your video series by providing an email address. You would then send them a series of emails directing them to different videos over several days or weeks. Of course, this sequence will consist of different Facebook ads rather than email messages. So imagine what each video of the sequence will need to be and create an ad for each one. You should think of this as a process. Warm them up, from beginner to expert (or from soft sell to hard sell). You are looking to gain their trust and convince them that a purchase is necessary over a sequence of messages. This doesn’t need to be complicated. I’ve created a very simple, two-step sequence. The second ad is targeted only at those who visited that landing page today and didn’t convert. My messaging in that second ad understands that the targeted user knows what my product is, but they may need further convincing. So I prompt them to ask any questions they may have about the product in the comments. 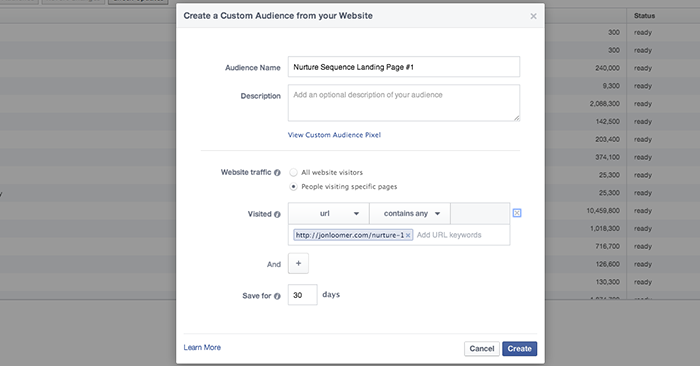 In order for this to work, you need to create a Website Custom Audience for each page of your sequence. It also helps — though it’s not required — that these pages are specific to your campaign and aren’t linked to anywhere else. If you’ve never created a Website Custom Audience before, you’ll need to add your pixel to the HEAD tags of your website template. See my tutorial for that. If you’ve created these before, just click the “Create Audience” button. You’ll want to name it something consistent with the name of your lead magnet landing page. It’s the first step of your funnel. Of course, you’ll want to create a list of anyone who visits that page. Duration is up to you. Clearly, the shorter the duration the greater the relevance. But of course, the shorter the duration the smaller the audience (and smaller the budget you can assign). Create a WCA for each landing page of your sequence. This way, you can create Ad #2 to reach anyone who saw Landing Page #1, for example; and then Ad #3 to reach anyone who saw Landing Page #2. You can do this in addition to the email sequence campaigns you’ve created. The key, though, is that you are no longer ignoring those who abandoned your landing pages. What I’ve laid out above are just examples of how you can use Website Custom Audiences to run a nurture sequence without an email address, but there are no hard and fast rules here. Experiment! Have you tried this? What ideas do you have? Let me know in the comments below!